We’d love your help. 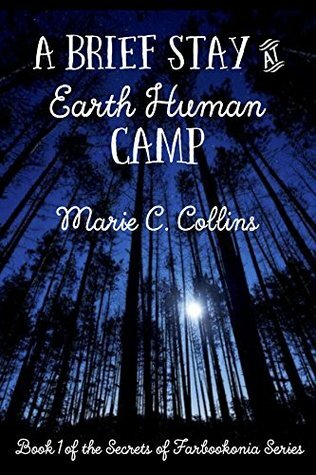 Let us know what’s wrong with this preview of A Brief Stay at Earth Human Camp by Marie C. Collins. Once you find out your mother is an alien, what ISN’T possible? That’s what 12-year-old Anne and 10-year-old Atticus Reade want to know. Minutes after learning their mother is a Farbookonian human, not an Earth human — making them half-alien — they’re whisked off to sleep-away camp in New Jersey for protection, each with a tiny Globot on one shoulder. They do their best to fit in at camp, but their sheltered existence in the Midwest didn’t prepare them for this. Everything is new to them, and at every step, their unpredictable Farbookonian talents threaten to give them away. Just as they settle in, a broadcast on the Rec Hall TV shakes things up, and they begin to see what’s truly strange about camp. As they race to solve a mystery involving ghost stories, quirky campers, a bizarre camp director, and a secret connection they share with their friends, only one thing is clear: They’re not safe. Can the things that make Anne and Atticus different help them survive? A Brief Stay at Earth Human Camp is a sci-fi, coming-of-age, mystery adventure! Author Marie C. Collins places relatable characters with alien abilities in a realistic setting that grows increasingly ominous as the story progresses. Reviewers recommend her to readers who enjoy the works of Roald Dahl, Rick Riordan, & J. K. Rowling. If you like stories that transform the ordinary into the extraordinary ... if you like characters that remind you of your friends ... if you like mysteries that keep you guessing until the final pages ... this book is for you. To ask other readers questions about A Brief Stay at Earth Human Camp, please sign up. At the beginning, the book feels amusing and light-hearted. Then it starts getting progressively more ominous. There are small climaxes everywhere, and more and more mystery builds. It is a race against time for Atticus and Ann The first thing I can say about this book is that, particularly at the beginning, the novel has the feel of the work of Dr. Seuss or Roald Dahl. The similarities really are impressive, and it really made me think that the book really was going to remain that light-hearted. Collins did a spectacular job on this novel, and it is really something that I would recommend for teens. Don't let the synopsis make you feel like it is too young for you, because I honestly thought it fit into the YA genre very well. I am amazed and thrilled at having stumbled upon Ms. Collins' work! A Brief Stay at earth Human Camp is truly a masterful work. I am one of those grown ups who read all the Harry Potter books and still uses her kids as an excuse to go to a Disney movie. I love young adult as a genre but have found lately that the skill is lacking in so many authors to actually weave a tale. Not so for Marie Collins. This is a lovely tale of Atticus and Anne, learning who they really are, attending camp for the f I am amazed and thrilled at having stumbled upon Ms. Collins' work! A Brief Stay at earth Human Camp is truly a masterful work. I am one of those grown ups who read all the Harry Potter books and still uses her kids as an excuse to go to a Disney movie. I love young adult as a genre but have found lately that the skill is lacking in so many authors to actually weave a tale. Not so for Marie Collins. This is a lovely tale of Atticus and Anne, learning who they really are, attending camp for the first time and meeting other children, also for the first time. We follow the adventure and mystery while sharing in the joys of budding friendships, the thrill of summer games and all that camp has to offer. I don't give spoilers, but will say that this expertly woven story captured me and and kept me involved, kept me there in the pages, at camp, listening to ghost stories, hiking through Jersey woods and befriending all the children and counselors as the weeks of summer went by too quickly. I am certain this book and following series will go far. The structure and writing are far beyond the bulk of what is on the shelves today. Firstly, I would like to say that this book is wonderfully written and fits well with the age group the book is aimed at. It isn't what I would usually pick up and read but I've got to know Marie and not only is she a fantastic writer but a lovely lady. The story centres on Anne & Atticus who have lived a very humble and sheltered life. The only people they've ever known are their parents and their dogs. They know nothing else until one day their parent’s secret is revealed and suddenly everything changes. Their mother isn’t from this planet. I mean growing up is hard enough for us humans but when your mother tells you she's actually an Alien and not from earth its mind blowing. They are sent off to a camp where they have to mix with human children in order for their parents to continue with their work. They are helped along the way by some tiny friends that only they can see. I felt for the two main characters as being a kid trying to make friends is terrifying but when you've never encountered any other life form and you have certain aspects of yourself that you have to hide that just adds to the mix. I think this will be a great read for kids of all ages and adults. I really enjoyed taking a chance on reading something new. This is my first experience with a self-published book, which I have been curious about. My initial impression was very positive--between the author's notes, dedication, inscription, etc., receiving this book felt as personal as attending a reading and having the author sign the book face to face. Its obvious that this book was a labor or love by a lovely person. This book, at its heart, is about the alienation felt by being different. A summer camp I received this book from a Goodreads giveaway. This book, at its heart, is about the alienation felt by being different. A summer camp is a great setting to exacerbate such feelings. The twist is that the main characters are half alien, so their feelings of alienation & their desire to fit in works on more than one level. Between the short chapters and heavy dialogue, it was an easy/fast read. I appreciated the camp maps, schedule, and roster for reference. There is a lot of bookish playfulness in the names: FarBOOKonia, the READes, Cameo, etc. More of this playfulness could've continued throughout the book but was abandoned for a more neutral tone as the siblings attempted to make friends and experience camp adventures. Much of the book is light with the primary tension being the day to dayness of fitting in and camp life. This made the book feel slow. There was too much in-the-moment dayness, and I would've preferred there be more at stake for the siblings earlier on. Being half alien, making friends, etc. was not enough for me. I expect more plot twists from YA--twists that ratchet up the tension and character development. I think Anne's lucid dreaming sequences were meant for this. The intended young audience for this book might find these sequences compelling. As an adult, I found them to be a little too telling or heavy handed. The evening camp stories were entertaining and fun. The various setting were described well, and I could clearly picture the various environments. The realistic portrayal of camp life was one of this books strengths. I did not like the initial "Dear Reader" narration. Directly addressing the reader can be a fun and playful device (think Lemony Snicket), but when used excessively and to express authorial opinions or frustrations ("I simply will never understand...") then the story is about the narrator instead of the characters. Because of this, I was pulled out of the story before it began and felt the story truly started when the siblings pulled into camp. I didn't need any of the set up before the camp and felt the backstory would've worked well if woven in during some of those early moments when the Reade kids felt frustrated by their alienation. Some of grammatical decisions showed a lack of trust between the author and reader, as if readers wouldn't understand intended meanings without the overuse of italics (which I found most distracting), Em dashes (which slowed the story), ellipses (which were never necessary), exclamation points, etc. I don't mean to sound like the grammar police (I am guilty of my own abuses). It's just an observation that distanced me from the characters and story. As stated before, the two main characters are Anne and Atticus. Both of their names are clearly derived from literary figures as the children were heavily raised on the classics. This is even more apparent when their father gives them sidekicks resembling Tinker bell and Huck Finn. And though I found our protagonists loveable if not overly naïve at times, their little robotical, literary helpers weren’t. Both Huck and Tink annoyed me endlessly and above all could’ve been cut out to greatly help the book. As for the other characters, there were quite a few I enjoyed, and even though the antagonist was and still at the end nothing more than rumors or lightly named, I still found them okay as well. First, there is little to no inciting incident beyond a quick mention by the parents, saying, “Something has happened. Something dangerous. We’re going to hide you in camp to keep you safe.” No mention of what happened or why it’s dangerous—two key elements to draw in readers. Because of this, I found little pulling me forward to read. Second, I don’t understand at all how in the beginning, both Anne and Atticus are raised like normal human children, getting their filled with normal human culture from all the books read to them and by them—to the next minute, their parents telling them they are half-farbookian and somehow they lose all their humanity. It makes no sense! And yet, that’s what happens. Finding themselves dumped in a human camp, they have no idea how to act and seem to be lacking any knowledge at all regarding to being human. They study the others as if they themselves are one hundred percent alien, and not half. For the first part of the book, this frustrated me to no end. But that wasn’t all. The first part was all loaded down in the extreme minutia of their first day. I’m serious! After the first ten percent were we get large info dumps about the kids’ farbookian powers and history, they finally get to camp and run through each encounter and event of the day for the next forty percent of the book. They met some kids that become enemies, then they play, then the enemies do something horrible for no reason, then they play, then the enemies come again. It happens over and over, and gets tiring fast. All of this is sad because finally by around the halfway mark, the plot decides to join us in what could’ve been an interesting book. Sadly, the author crams all the juicy stuff into the end half, and she really does cram it in. Sometimes, it is overwhelming how much stuff you have to take it. Had this information been delved out slowly over the course of the book, it would’ve been a far better and smoother read. I wish I could give it a higher score. The end had all the parts of a good read shoved into it like an over-crowded kid’s closet packed with toys. On top of that, the protagonists were interesting and loveable enough with enough mystery in the last half to make it compelling. Unfortunately, the whole botched first half ruined it. Supposedly, there will be a second book. I hope in this one the author takes her time, focusing on the plot more than ridiculous situations and characters. This book is written so well for the market it is aimed at – teens/YA. It has the same feel as Harry Potter, in many aspects. The depth of character is very similar. Each character is fun and has their own personality and ways they react to things. They also have the possibility of us watching them grow up, as we did with the Potter series, as they start at that age and really are written as if they were heading into their teens years, leaving a lot of option for things they can encounter. The int This book is written so well for the market it is aimed at – teens/YA. It has the same feel as Harry Potter, in many aspects. The intricacy and depth of the story and plot are similar, in that the story is fun and light-hearted, but it still has depth, surprises and climaxes that teach the kids something or help them grow as a person. They face challenges and overcome obstacles, giving it a feel of action and the world is set in a way that it is similar to our, but the slight twist, in the aliens on the planet. I liked the way the book easily ends well, so that you are satisfied with the read, but excited to read more. I know I cannot wait until the next book comes out. After meeting Marie C. Collins at one of my first author events, I finally got the chance to read her work. Just glancing at the first few pages you can tell how well thought out Collins built her world. The incredible effort put into this story is one of the reasons I loved it! My favorite part about reading is knowing that the authors actually care about their work and it is clear in A Brief Stay at Earth Human Camp that the author poured herself into her work. There's world building and then After meeting Marie C. Collins at one of my first author events, I finally got the chance to read her work. Just glancing at the first few pages you can tell how well thought out Collins built her world. The incredible effort put into this story is one of the reasons I loved it! My favorite part about reading is knowing that the authors actually care about their work and it is clear in A Brief Stay at Earth Human Camp that the author poured herself into her work. There's world building and then there's extreme world building which is what Collins has done and it is something that will appeal the books age group. It's a refreshing read and I really enjoyed the fact that, even though the kids went to camp in New Jersey, most of the kids weren't from the US. Three cheers for diversity! The 'Globots' were an interesting twist and provided a lot of humor, especially Bella. I think my favorite part is when Annie starts dancing to music in her head, it was like reading second hand embarrassment. A fun young adult story that gives an entirely new perspective on coming of age and dealing with new situations and new people. Some parts were definitely difficult to read as they were awkward and I felt horribly for the two main characters. But overall there was a great outcome and the main characters showed great growth and maturity. I received this book from Goodreads giveaway. This was a great book. Fun and great for tweens and teens. I'm sorry to say that this book wasn't for me. I just couldn't get into it and there for I feel I can give it a fair review. While the atmosphere was lovely and made me feel like I was at camp, and the plot was intriguing, I can't recommend this book for the age group indicated. I don't like leaving negative reviews, and I hope the author never reads this, but if she does: remember perspectives vary, and know that mine isn't suggesting a talent issue but rather that I believe more beta testing and revisions were necessary. I'm including details because I think it's only fair that future readers of this review be able While the atmosphere was lovely and made me feel like I was at camp, and the plot was intriguing, I can't recommend this book for the age group indicated. I don't like leaving negative reviews, and I hope the author never reads this, but if she does: remember perspectives vary, and know that mine isn't suggesting a talent issue but rather that I believe more beta testing and revisions were necessary. I'm including details because I think it's only fair that future readers of this review be able to look over my thoughts and see whether they think my opinion is justified or if I'm just full of bologna. Marie holds a bachelor’s degree in English and Journalism from Douglas College at Rutgers University and a master’s degree in Engl Marie lives in Lambertville, New Jersey (USA), with her two dogs, George Eliot and Henry James, who — in spite of their snoring and a tendency to sniff horrifying things — are very good company (and endure Marie’s insistence that they love being kissed on their snouts).